Dynamite Nurse is a game by Atsuo Yoshizawa, published by Japanime Games. It is for 3-5 players. In this game, players take on the role of nurses in a temple of healing set in a fantasy world. In other words, they’re doctors in a hospital. Their main mission is to heal adventurers that have been stabbed, bludgeoned, shot, petrified, infected, poisoned, level drained or suffered any other number of horrible injuries while out adventuring. Of course their opponents may try to sabotage them along the way. If too many patients die, the player will wind up getting the infamous Dynamite Nurse moniker and be feared by all. However if they perform well, they’ll become a respected doctor and cement their reputation as a great healer. In the end, the doctor…I mean player, that earns the most victory points will be declared the winner. To begin, the cards are separated by type and then set out into face up piles. The Patient cards are shuffled and placed with their critical condition side face up. Each player receives one of the starting nurse cards with a red star by their name. Any remaining starting nurse cards are returned to the box. The other nurse cards are shuffled together and placed face down. The event cards are removed from the action cards and are shuffled together and placed face up in a pile. The regular action cards are separated into face up piles, giving each named type of card it’s own pile. The piles are then grouped together by color. Each player is given the duty markers that match their starting nurse’s color, which are placed in front of the player. Any remaining duty markers are returned to the box. Each player is also given 5 Examination cards and 3 Simple Surgery cards. These cards along with the player’s starting nurse card are shuffled together into the player’s starting deck. The deck is placed face down in front of them. Any remaining Examination or Simple Surgery cards are returned to the box. It should be noted that the middle of the play area where all the shared cards is located is known as the “Town”, while the area in front of the player where they place their own cards is known as their “Hospital”. The piles of cards are set up in the Town as diagrammed in the rulebook. The patient cards are turned over with the critical condition side facing down. The kill mark cards are placed in order with the 15 card on top and the 1 card on the bottom. The 13, 14 and 15 cards are returned to the box if only 3 players are playing. Each player will now draw 4 cards from their deck to form their starting hand. The first player is chosen and play now begins. The game is played with each player taking a turn. On a player’s turn they will follow 4 phases; main phase, transportation phase, admission phase and cleanup phase. The first phase is the main phase. In this phase, the player can take one action and they may play cards from their hand one at a time, as many as they would like. These can be done in any order. When a card is played, the text box takes effect immediately. Both action cards and nurse cards may be played. Action cards provide bonus points in the form of treatment points or gold. Treatment points allow the player to treat one patient. This may be through operations or care. Operations are performed by the player paying the amount of treatment points equal to the large severity icon’s value on the card. Once healed the patient is healed and discharged. It should be noted that a patient must first be admitted to a player’s hospital with a duty marker on it. Once the patient is discharged, the player removes their duty marker and places the patient in their victory point stack to be scored at the end of the game. They also take a card of their choice from the nurse pile, placing it face down in their discard pile. Providing care is when the player pays the smaller severity icon on the patient card. In this case, the patient is not discharged but is flipped face up taking them out of critical condition. The other action that may be taken instead of treating a patient is using gold to buy an action card from the Town. This is done by paying the amount of gold on the chosen card and then placing it in the player’s discard pile. It should also be noted that a player may chose to buy an event card. They may either chose the top card or the card beneath it. However they aren’t allowed to look at it before buying it. Even if the player is not able to pay for the second card, this still counts as a purchase action. The next phase is the transportation phase. In this phase the player will transport a patient and assign duties. To transport a patient the player takes a patient card from the top of the Dungeon and moves them to an ambulance. Any patients already there are moved down away from the Dungeon and are arranged in a row. The patient farthest from the Dungeon is the lead patient while the one closest to the Dungeon is the trailing patient. It should be noted that if the Dungeon runs out of cards, the game ends immediately. Once transportation is completed, the player will then select a player, including themself, to take charge of that patient. Once selected, the player places their duty marker on top of the patient card. It should also be noted that their is a limit to the number of patient cards that may go into an ambulance. That limit is equal to the number of players. If the number of patient cards in the ambulance reaches that limit, then transportation is not completed and one of the patients in the ambulance enters into critical condition. Starting with the leading patient, the chooses a patient that is not already in critical condition and flips the card over to it’s critical condition side. The last phase is the cleanup phase. In this phase the player will discard all the cards that they played, as well as any cards remaining in their hand. However the player is allowed to keep one card from their hand if they choose. The discarded cards are placed into the player’s discard pile. The player will then draw 4 card from their deck to refill their hand. Even if they choose to keep a card, they will still draw 4 cards. Play then passes to the next player in turn order. The game continues until one of the two game end conditions is met. If the pile of kill mark cards runs out or if the dungeon runs out of patient cards, the game ends immediately. Once the game is over, players add up their victory points from patient cards that they have acquired, for patient cards that have been admitted to their hospital and from play cards and nurse cards the player owns. They will lose victory points based on how many kill mark cards they have. The player that has the most victory points is the winner. This game comes with a fairly large stack of cards. There are several different types of cards some of which have duplicates of to be used in the Town. The artwork on these is designed with an anime/manga style look to them. In many cases there is a good bit of fan service in regards to the designs, some of which players may find a bit over the top. I would say that if the players are comfortable with games such as Tanto Cuore or Kemomimi Panic then these cards won’t bother them either. For the most part, it’s just something to be aware of, especially for those with younger players. The cards themselves are well designed and I especially like the look and feel of the cards. There’s a bit of iconography that takes a little getting used to, but nothing that’s too difficult. The game also comes with some cardboard duty markers in several different player colors. These are brightly colored and pretty thick. I really like the quality of them. There are also some dividers included in the box to keep everything separated and easier to find what you’re looking for. There’s plenty of room for more stuff including expansions in the box. Overall I like the look and feel of the game. Just be aware of the excessive nature of some of the cards. The rulebook for this game is very reminiscent of the ones that you’ll find in games like Tanto Cuore. They’re all in black and white and are about the size and width of the box. There are plenty of great looking pictures yet the black and white quality leaves you wanting more. The book has a few examples and some really great details on each of the different card types and how they work. The rules are detailed out quite nicely so that everything is fairly easy to understand. The book also has a section devoted to different game terms, as well as a great section of frequently asked questions about the different cards. Overall the rulebook is pretty good. It covers everything quite well and looks pretty good too. I simply wish that there were some color to these pages as it just looks so drab an uninteresting. As I mentioned in my preview review of this game, this one takes an interesting spin on the deck building mechanic. It uses some of the same ideas on game play as are found in games like Dominion or Tanto Cuore. The game starts off with lots of different card types that are available for purchase, including patients to cure. It’s what you choose to do with what you draw that determines what options you have available to you. If you only draw a hand of Consultation cards, you’ll only be able to buy cards. No need worrying about treating a patient this turn. Of course the balance of treating patients and adding cards to your deck is key. You also have to keep an eye on the patients in your hospital and those in the ambulance. Too many dead patients and you’ll wind up with the infamous Dynamite Nurse card, which you really don’t want to keep, especially at the end of the game. I think that that game has a really fun and humorous style to it. I think that most people that enjoy deck builders like Dominion and especially Tanto Cuore, will get a lot of enjoyment out of this one too. I have to say that I do like treating the patients, especially since this is where you get the majority of your victory points. However it’s a bit more than that. I like that it kind of gives you a feeling of accomplishment. It’s a really neat aspect that makes this game different. I still wish there was a 2 player option for the game, maybe even a solo version for the ever alone players out there. As it is, I don’t know of any work on either of those variants but would love to see it happen. As I said, I think deck building fans will really enjoy this one. I know that I do. I also think this one will appeal to anime and manga fans as well. This is a game that I would highly recommend. It’s a lot of fun and appeals to my inner otaku. Dynamite Nurse is a deck building game that is based in an anime/manga style hospital. The game isn’t too long. Most game sessions last around an hour. The game is really well designed and the cards are great. The artwork in some cases is a bit over the top and may not be suited for younger players. Just something to be aware of. However if Tanto Cuore and/or Kemomimi Panic don’t offend you then the artwork for this game shouldn’t either. The rulebook could use a bit of color but overall is pretty well thought out and covers everything nicely. The game itself is quite fun. 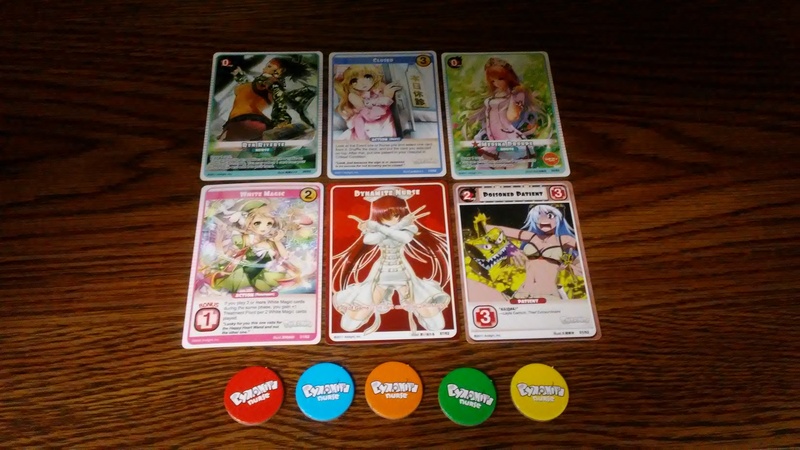 I like the unique take on deck building while still incorporating some of the same styles as Dominion and Tanto Cuore. Fans of these games should enjoy this one as well, especially if they like anime or manga. I still am hoping for an eventual 2 player or solo variant for the game, but nothing yet. I think this game was just what I thought it would be…great. I highly recommend it. It’ll cure what ails you. This entry was posted in Reviews and tagged atsuo, Atsuo Yoshizawa, board, board games, card, card games, dynamite, dynamite nurse, japanime, japanime games, nurse, yoshizawa. Bookmark the permalink.